Increases in precious metals ranged from 0.2% for platinum to 1.1% for palladium. Gold advanced 0.5%. Precious metals futures registered mostly modest gains Tuesday. 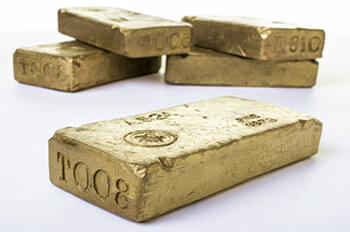 Still, gold marked an eight-and-a-half-month high and silver scored a six-and-a-half-month high. Gold for February delivery tacked on $5.80, or 0.5%, to settle at $1,308.90 an ounce on the Comex division of the New York Mercantile Exchange. The settlement was the highest since May 14 when gold ended at $1,318.20 an ounce. "There’s plenty of reason to still look at gold as a means to have some protection" given expectations that other markets will continue to struggle, especially stocks, Saxo Bank analyst Ole Hansen said, according to Reuters. Gold futures ranged from a low of $1,301.70 to a high of $1,310.80. They added 0.4% on Monday. Silver for March delivery increased 7.4 cents, or 0.5%, to settle at $15.839 an ounce. The close was the strongest since July 12 when silver settled at $15.977 an ounce. Silver futures traded between $15.72 and $15.93. They climbed 0.4% on Monday. April platinum added $1.30, or 0.2%, to $815.80 an ounce, ranging from $813.20 to $821.60. Palladium for March rose $14.30, or 1.1%, to $1,303.60 an ounce, trading between $1,284 and $1,317.10. United States Mint bullion sales climbed by a combined 1,500 ounces in American Eagle and Buffalo gold coins and by 26,500 ounces in American Silver Eagles.